In Ancient Greece, Sea Bream considered to be the tastiest of all fishes was devoted to Aphrodite, the goddess of beauty. About three hours from downtown Athens, on the Nafpaktos-Itea road, past the ancient sanctuary of Delphi and the craggy slopes Mount Parnassus lies Galaxidi, a picturesque town heralding an era of Greece’s maritime prowess. The area’s peak of prosperity was from the mid 1800’s to the early 1900’s when Galaxidi-built tall ships with square-rigs and twin-masts, carried an array of cargo from the Black Sea and Mediterranean to and from the ports of Europe, Africa, North and South America. Galaxidi, however, did not make the successful transition from sail to steam-powered vessels, and like the merchant marine powerhouses of Hydra and Spetses, the town lost its economic lustre. Today a different type of maritime prowess is taking hold in this coastal community where serenity and science go hand in hand. As Greece is gripped in the throes of an economic crisis, the pocket books of Galaxidi remain largely sheltered thanks to aquaculture, which is reshaping the Mediterranean diet while restocking the local seas. 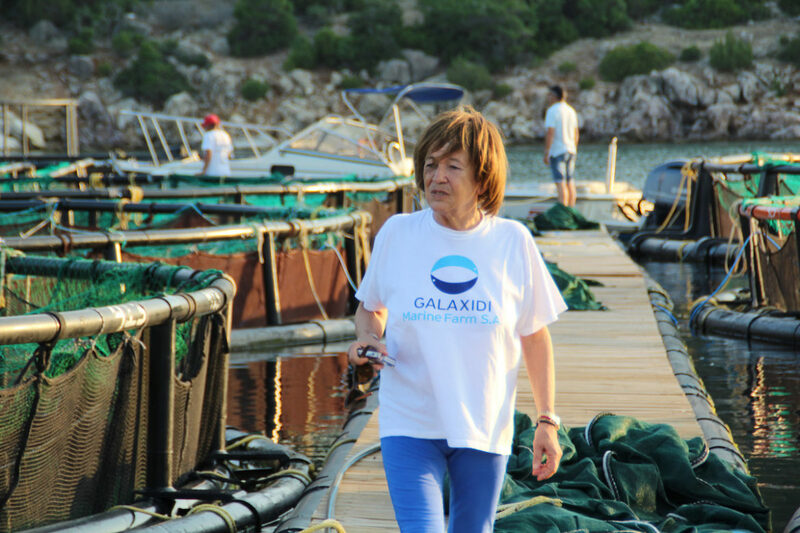 We recently visited Galaxidi farms and Nancy Panteleimonitou, the matriarch of Greece’s aquaculture industry, was kind enough to take us on several tours of the fish farm and hatchery. “The hatchery is mainly run and operated by women, because the little ones (smolts) need clinical clean and women are good at respecting those rules. We (women) do it because we know how to keep everything clean and running well. 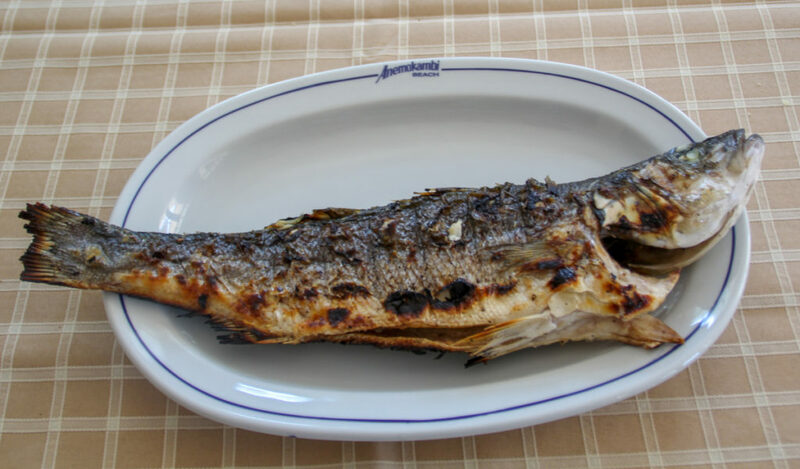 For Greece, Nancy’s operations are part of its drive to make the aquaculture industry a pillar of its national economy and a critical vehicle to help replenish its wild stocks, especially those delicious sea breams. For Nancy, she has not only seen this happen, she has made it happen in Galaxidi. One summer night, last year, just after the moonrise, the townspeople gathered in the garden of Voula Manouloudi in the Harbour of Galaxidi to honour the “accidental fish farmer”. A local reporter had already dubbed her the “Queen of Bream”. She went home that day with a book full of felicitations from the gathering organized by the Galaxidi Citizens Initiative, who thanked her for revitalizing their town, replenishing their sea and restoring their livelihoods.It is her most prized possession. “I am a fish farmer and this is my life…I believe it will help Greece grow and provide jobs just like in Galaxidi…and the fishermen here already tell me they are seeing the sea bream come back,” added Nancy. In the video, below, Nancy took us on the tours of Galaxidi Marine Farm, from hatchery to sea and back again to the processing plant and finally to the kitchen, and onwards to our happy tummies. Along the way we learned about the people and fish as Nancy retold many stories of their journey together.